Guess what, it didn’t work out! After modification when I tried to upload the file again, the same problem occured again. What happened? According to the error message, the web.config or applicationhost.config should be configured according to the above suggestion. Modifying web.config didn’t work out. So, the applicationhost.config could be modified to see what happens. Wait a minute! 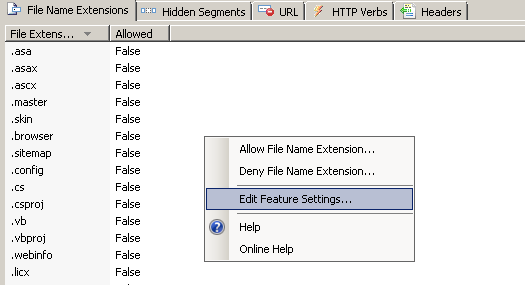 the applicationhost.config is the configuration file of IIS (IIS7.0 or heigher). 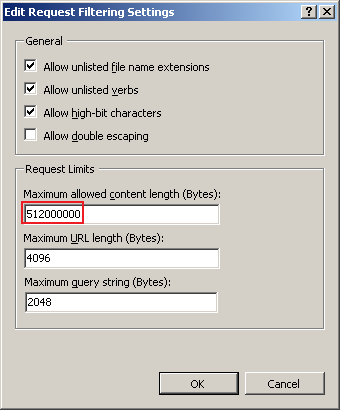 Does that mean IIS has a Request size validation? Yes it has. Until IIS 7.0 there was no Request size validation, but since IIS 7.0, the Request length is verified by IIS first, before deliverying the Request to Asp.net. So, to be true, it doesn’t really make any sense to increase the maxAllowedContentLength value in web.config. The Request dies even before reaching the Asp.net. So, whatever is to be configured, it has to happen at IIS. Modifying the above configuration worked for me in one PC (Running Windows 7+IIS 7.0), but, didn’t work on another one (Running Windows Vista + IIS 7.0). After configuring the applicationHost.config file, I tried to upload the large file and the same error message was appearing again. I don’t know why, but, if you have the same experience, applying the following approach (Configuring via IISManager) would definitely work. Select “Features View” and double click on the “Request Filtering” icon. 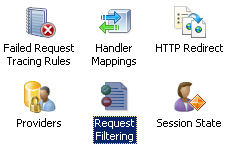 If you can’t find the “Request Filtering”icon, you need to install the IIS Administration Pack from this link : http://www.iis.net/download/AdministrationPack. This is a lightweight installation which shouldn’t take too much time on a decent internet speed. This entry was posted on Saturday, January 4th, 2014 at 5:40 pm and is filed under Asp.net. You can follow any responses to this entry through the RSS 2.0 feed. You can leave a response, or trackback from your own site.